Sarap to share! Check out Max's TakeOut Treat! Get one (1) Regular Whole Max's Fried Chicken, with Max's Banana Ketchup, 1.5-liter Pepsi, and limited edition Max's Eco Bag for P405 only! 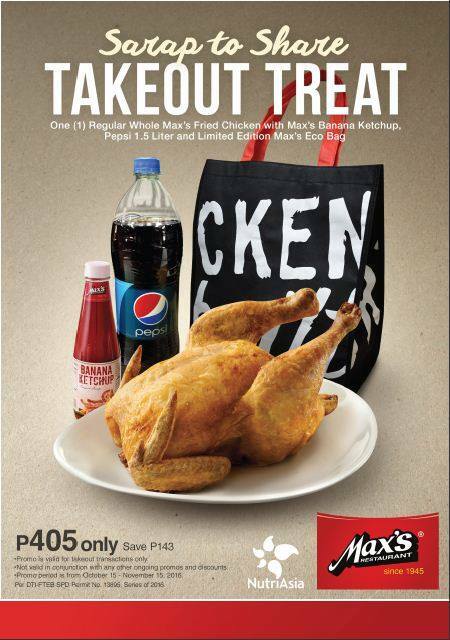 Promo runs from October 15 to November 15, 2016 in all Max's Restaurants nationwide! Valid for takeout orders only.